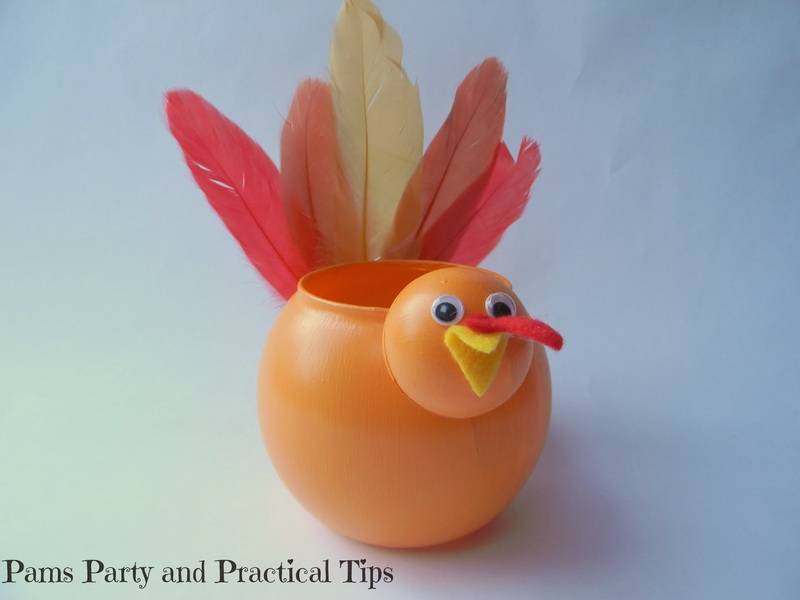 Here is another quick and easy turkey craft just in time for turkey day. The glass bowl is from the dollar store. The head is made from a ping pong ball, also from the dollar store. 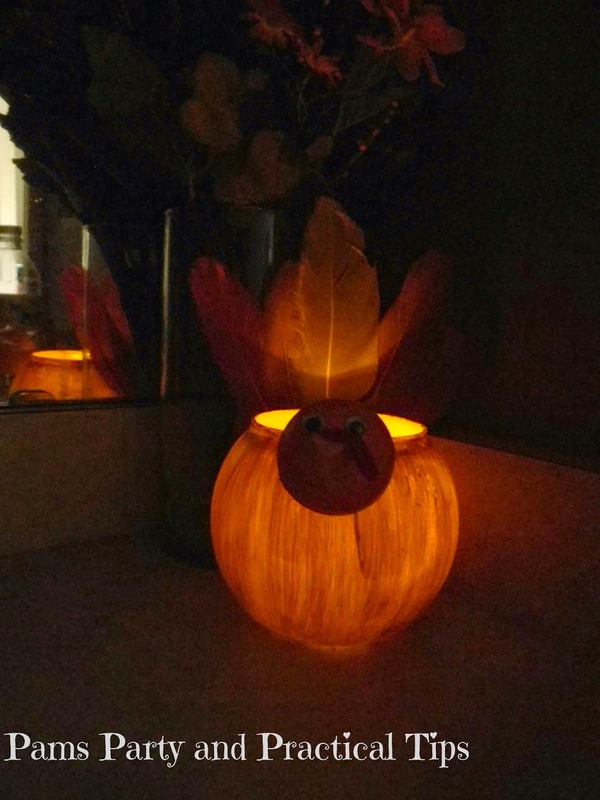 The feathers are from Michaels. I think I got them for about $2, and there are plenty in the package to make several crafts. I know turkeys are brown, but I decided to go with orange so it would be easier to see the light when it was turned on. 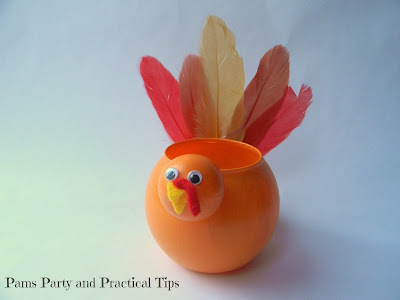 I used acrylic paint that also works on glass on both the bowl and the ping pong ball. 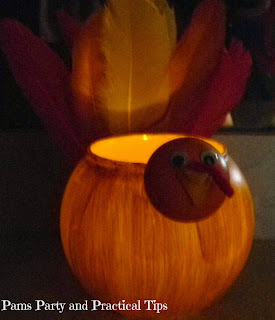 Once it was dry, I used a glue gun to add the feathers to the back and the head to the front. I used felt for the beak, but it can also be made from paper, craft foam, or anything else you want to use. 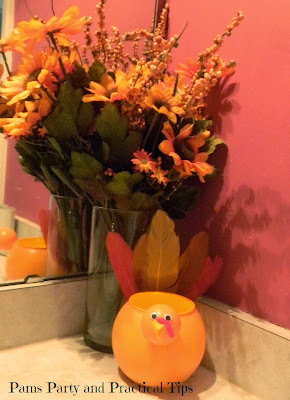 My votive found a home in the downstairs bathroom near a bouquet of fall flowers. Inside the bowl is a battery operated tea light that is also found at the dollar store. He looks happy all a glow! I like the orange turkey!! I wish I had these all over my house! So cute! Thanks for sharing! How cute! I love it when it's all lit up with the candle inside. So cute and easy to pull together. I love crafts like that. I don't always have the time to craft, so this would be perfect. I love how it looks with the glow, but it's super cute without being lit too.